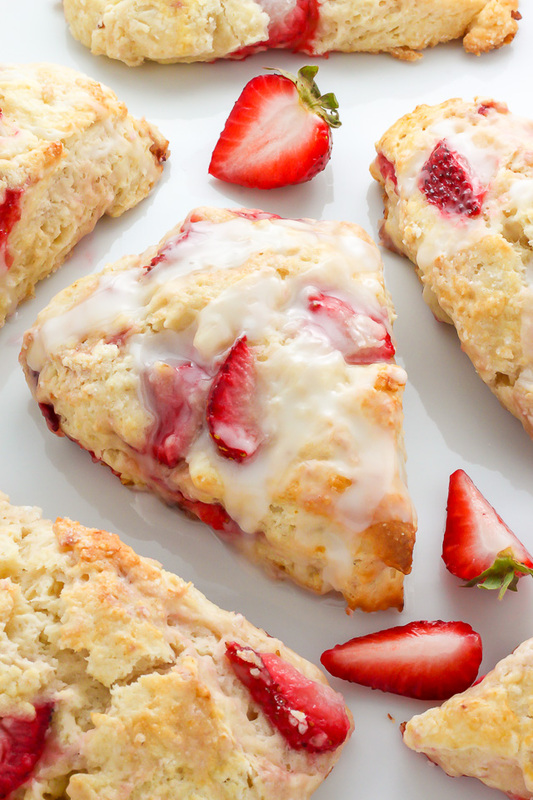 Strawberries and Cream Scones are tender, flaky, and bursting with fresh strawberries in every bite! 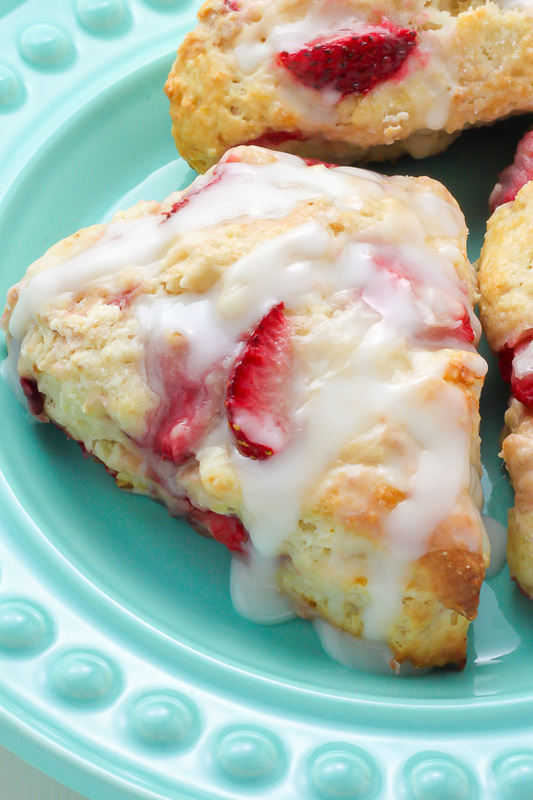 We love serving these strawberry scones with coffee or tea, and extra glaze on the side. 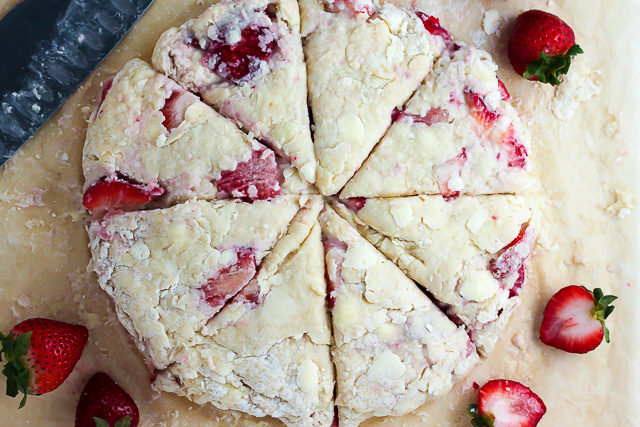 The perfect strawberry scone recipe for occasions like Mother’s Day or Easter brunch! Spring is quickly approaching, and with it comes fun holidays like Easter and Mother’s Day! We always host brunch on those holidays, and one of my favorite ways to welcome guests to a brunch party is with fresh scones and a variety of tea and coffee options. It’s a simple step that makes guests feel extra special! And it also allows you a little extra time in the kitchen to put the finishing touches on any other dishes you may be preparing. I have a TON of scone recipes in the breakfast archives, but these gorgeous glazed strawberry scones may just be my favorite! They’re very easy to make and use simple ingredients I always have on hand. And they’re not dry like a lot of scone recipes. Instead they’re buttery and flavorful!!! Plus, it doesn’t hurt that they’re absolutely gorgeous. 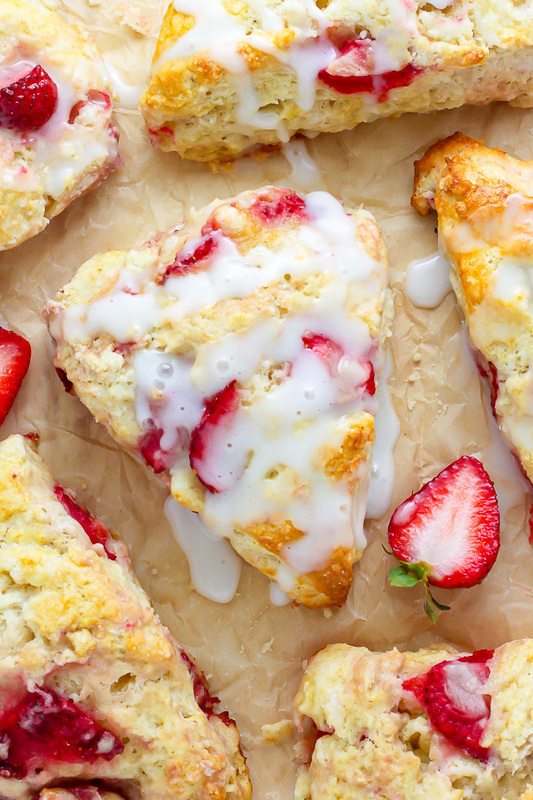 Everyone’s eyes perk up when they see these beautiful strawberry scones on the table! Sweet, fruity, buttery perfection in every bite. Warm from the oven, with a hearty drizzle of vanilla cream, and cup of coffee… there’s truly no better way to start a morning!!! Alright. Enough of my gushing. Let’s chat recipe details, y’all. You’ll also need confectioners’ sugar for the drippy and delicious vanilla glaze! The recipe assembly is pretty simple and straightforward. You’ll begin by combing the dry ingredients in one bowl. Then you’ll work in the cold butter (very cold, remember?) until it resembles a coarse meal. Kind of like this. Once this is done you’re going to add in your milk, cream, and egg. Then it’s strawberry tiiiiiiime! As mentioned earlier, it’s best to chop your berries into quarters. I tested this recipe three times and found a larger strawberry cut to yield the most delicious results. If you have really large berries, feel free to cut them into small pieces. When you dump the scone mixture out onto your work surface it’s going to be a loose and shaggy mess. Not to worry, because just a few easy kneads and you’ll have a manageable dough at your fingertips. Cut the dough into 8 triangles, place them on a baking sheet, and pop them in the oven! Get ready for your home to smell amazing! Because when these scones are in your oven, wafts of vanilla and swirls of strawberry will be dancing through your kitchen. It’s a luxury to be savored and enjoyed. Can I freeze strawberry scones? Yes! 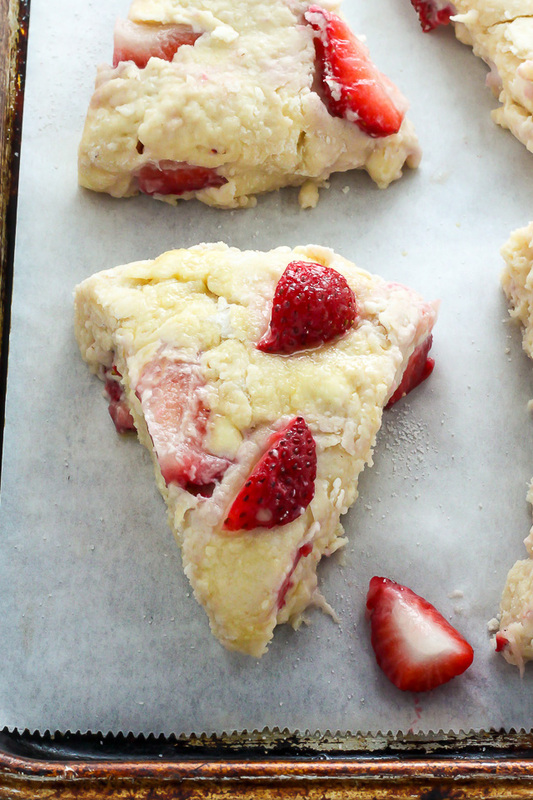 This strawberry scone recipe freezes great for up to 2 months! When you’re ready to enjoy, simply thaw overnight in the refrigerator then heat them up, cover with glaze, and enjoy! 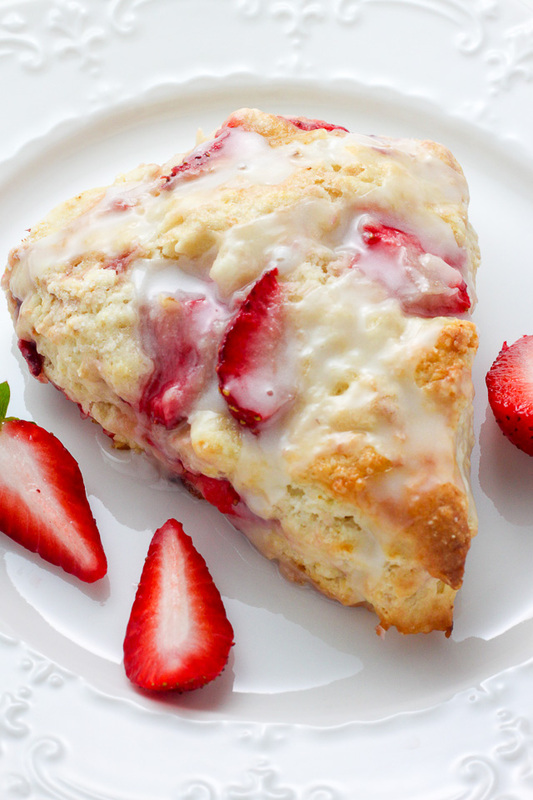 AND IF YOU TRY THIS RECIPE FOR STRAWBERRIES AND CREAM SCONES, LET ME KNOW! LEAVE A COMMENT BELOW AND DON’T FORGET TO SNAP A PIC AND TAG IT #BAKERBYNATURE ON INSTAGRAM! SEEING YOUR KITCHEN CREATIONS MAKES OUR DAY. 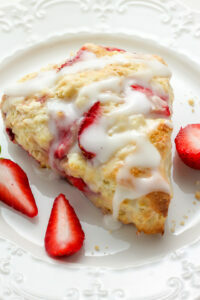 Classic and crumbly fresh strawberry scones topped with vanilla cream. Even scone haters LOVE these. 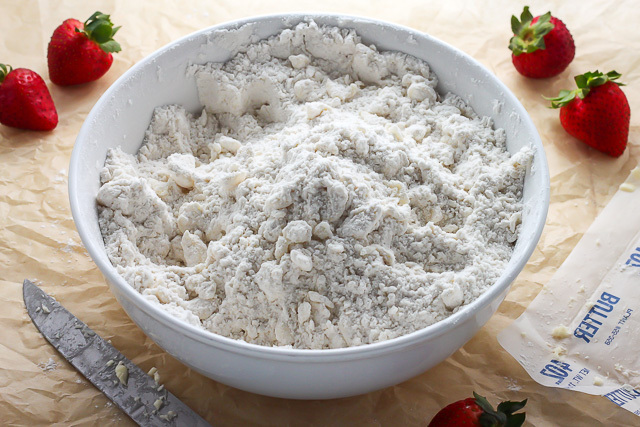 In a large bowl combine flour, salt, baking powder, baking soda, and sugar; mix well to combine. Cut the butter into small cubes then work it into the mixture (using your fingers, two forks, or a pastry cutter) until lit resembles a coarse meal. In a small bowl whisk together the egg milk, and cream. 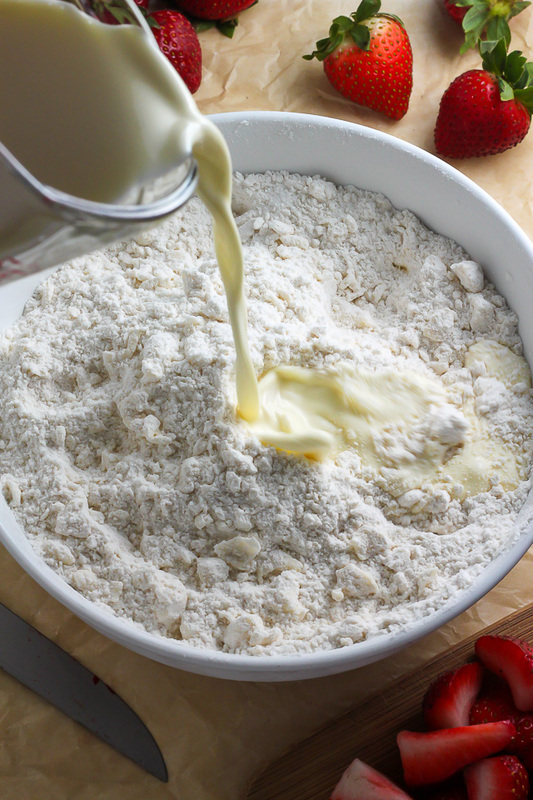 Add to flour/butter mixture and use a fork to stir everything together until just moistened. 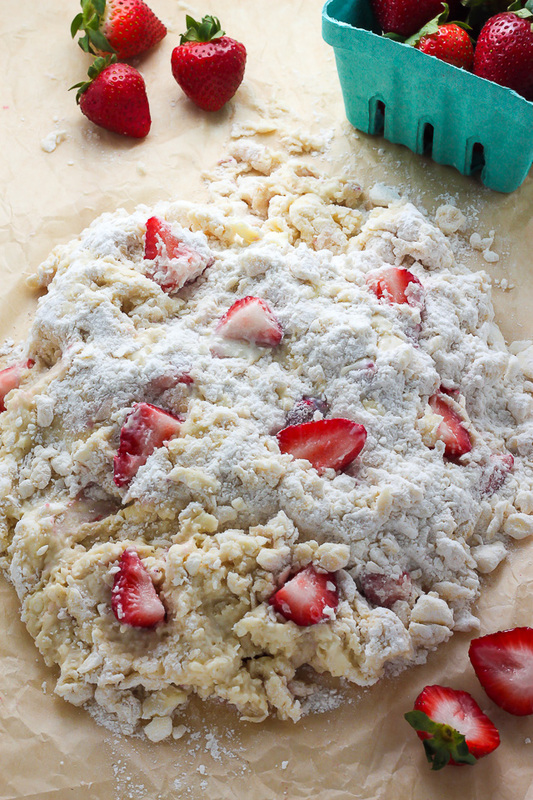 Add strawberries and using a rubber spatula gently fold them into the dough. Don’t worry if some of the berries break up a bit. Empty the loose dough out onto a clean, floured work surface, then shape the dough into an 8-inch circle. *You may need to knead the mixture a few times to get it to a workable texture. Cut the dough into 8 wedges and carefully transfer them to the prepared sheet, placing them 2" apart. Lightly brush each scone with the egg wash, then sprinkle the tops with sugar. Bake for 18 minutes, or until light golden brown. Allow scones to cool for 10 minutes on the baking sheet. In the meantime you can make your glaze. 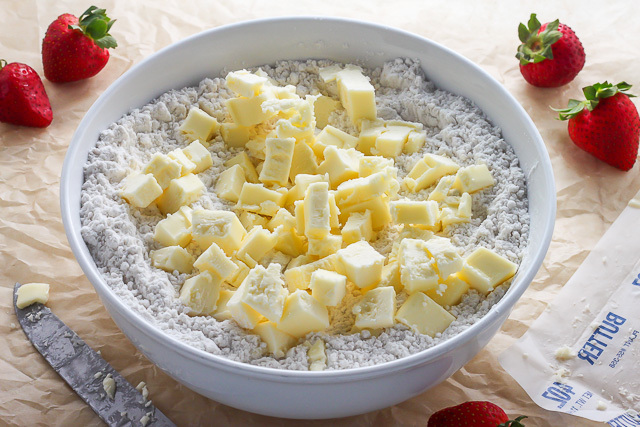 In a small bowl whisk together the heavy cream, confectioners' sugar, vanilla, and salt. Drizzle over semi-warm scones and serve at once. With a cup of coffee, these scones are breakfast perfection 😉 Thank you, Medeja! I can’t resist a good scone! These look amazing! I made these! My 1st attempt at Scones EVER…great instructions and helpful hints..I’m so pleased at how they taste and look!! I am goinge to try these! I would love to know what the name of these plates are and how I can purchase them. I would love to buy them from you if I can. You are amazing! Hi Kathy. The plates are from random stores, including Homegoods, TJ Maxx, and Anthropologie. I hope you enjoy the scones! My name is Angela. I run the blog, foodiebliss, on Tumblr and I was wondering if I would be able to use your current and future photos to post on my blog? I do not take credit for anything I post on my blog except my own creations. I never publish any recipes. There is always links back to the homepage and also the link of the post. I have included my blog’s website address so you can see examples of how it will look. Hi Angela. I allow up to one photo from a post to be shared on outside sites as long as there is clear photo credit and no printed recipe. I made these last week for my co-workers and they were delicious! I always make your cupcake recipes and love how clearly they are written! This was my fist time making scones and they were definitely easier than cupcakes 🙂 I made the scopes the night before and then iced them fresh in the morning. Thank you again for such an awesome and yummy recipe! Hi Erika. I’m so happy to hear you’ve enjoyed making my cupcake recipes and have now ventured into making scones 🙂 What lucky co-workers you have. Thank you for letting me know everyone enjoyed this recipe! Why is heavy cream listed as an ingredient for the batter but not as part of the instructions? Perhaps a typo? Please clarify. So I substituted Splenda for the sugar and did not glaze….these are fantastic. I make all different kinds of scones but these are an absolute favorite. Question though. Right now strawberries are in season so I can get them cheap. Can I make with frozen/thawed strawberries? Thanks, Donna. ps, I found a way to make powdered sugar from splenda but chose not to glaze them because my husband doesn’t like stuff really sweet. But I will give them a shot with the new glaze when I make for work. Thanks again! Wow! I just made these and I can definitely say, they taste just like strawberries and cream! These scones are so flaky and buttery, and every time I get a strawberry it leaves me wanting more! Great recipe, will definitely be making again! How do you get them to keep their shape? They turn to triangular blobs the several times I’ve made them (taste is amazing! They just don’t look as pretty as yours do). Try chilling the dough first (or chill it in the fridge, carefully sealed, prior to shaping). This happens with some cookie doughs too, which is why a lot of peanut butter cookie recipes have you chill the dough for a bit before baking. Possibly add less milk, or hold back some, then add if needed. It should be a craggy mess as in the photos, but maybe your flour is “holding” more moisture than some of ours. My batter was slghtly damp but it held up beautifully. Also check your baking powder.. old? fresh? I patted the dough into an 8 inch straight sided cake pan then flipped it out onto the counter. Used a bench scraper to cut it into eighths. Can you use a scone pan? Excited to try! Hi Tamara! I’ve never baked with a scone pan, but I think it should work 🙂 I can’t wait to hear how they turn out for you! These are amazing! I finally made them today and they’re delicious! They didn’t rise very high but I mostly blame that on my old and untrustworthy oven as I did chill the butter and dough before baking. It doesn’t matter, as they still baked up beautifully flaky and soft. The vanilla glaze pairs wonderfully with the strawberries, too. I reckon I’ll be making this for a lovely summer treat a lot this year! Thanks for the recipe! That’s awesome, Debi! I’m going to try them with raspberries soon – sounds delicious. Can I substitute blueberries, and, if so, do I use the same amount? Should I change the recipe in any other ways if I use blueberries? Thank you for this recipe! I have made scones before without much success so I didn’t have a lot of confidence in my ability this time either. They were kind of a hot mess before I put them in the oven but I have to say they came out great and were delicious! A big hit with my husband, daughter and her boyfriend. My strawberries weren’t as good as I hoped so instead used frozen blueberries. I have never made a scone before. Actually, I dont do a whole lot of baking at all but had a wild hair to try a scone. My forte is competition barbeque so if the guys get wind that I am making scones, I may never hear the end of it. Anyway, after looking through many recipes, I wanted to use yours. I got up early one morning and made them so my wife got one before leaving for work that day. I must say they were amazing! Fluffy and full of flavor (yes, I am a tough guy and I just used the word fluffy, get over it.). However, I am the kid who sticks a fork in the electrical outlet after my Dad said never to do it so when you said “trust to use bigger pieces of straweberries for this recipe”….well……I stuck the fork in the electrical outlet. I made two batches, one with larger chunks of fresh strawberry and the other with cut up smaller pieces. Both were great but, just as my Dad was the wiser one, so are you! 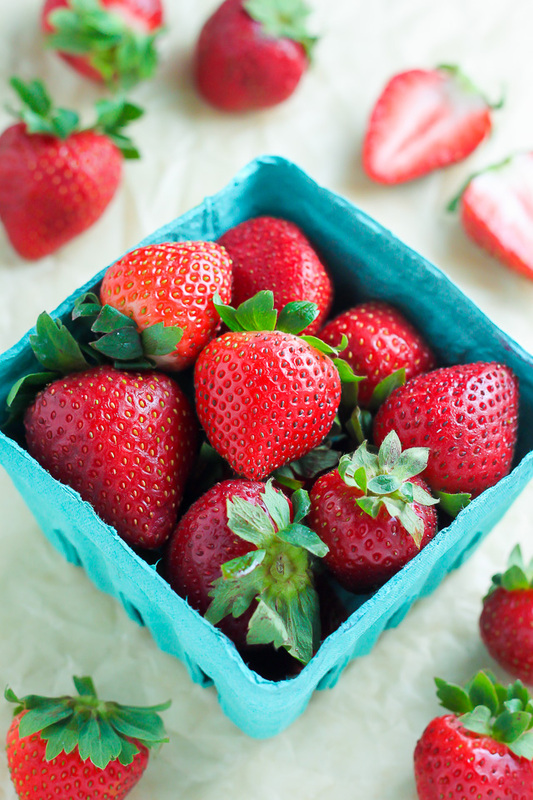 Use the larger chunks of strawberries for this recipe. This is a fantastic recipe. Thanks for sharing it. Just made these today and they are fantastic. My husband had two already and he’s a scone hater! Great recipe! we eat scones a lot here and a lot of them are made with Graham flour but as you said, I didn’t change anything, except I usd half and half for all the liquids because I didn’t have any cream, didn’t do egg wash and sugar and I didn’t glaze them because I was afraid they would be too sweet. But they were great and we had them with some cheddar cheeses and some tea for a light lunch. That was one happy husband here. Just made these for my 18 year old daughter’s English lit class. They are having a tea party. They are wonderful,thanks for the recipe. Made your scones for a baby shower last night and none came back! I have a question shouldn’t the vanilla go into the scones and not the icing? My icing turn tan colored not white like in your photographs. I would love a reply! Also the first time I made them I patted the dough into an 8 inch cake pan and then cut it into 8 pieces. A bit big for a baby shower. I then used at 6 inch cake pan and made 2 sets of 8! Better size for mini treats! I used the cake pan for a form. I did not bake them in them. Just finished baking these and while the look beautiful they are like a biscuit not a scone. Soft and moist inside. I followed the recipe to a T.
As someone suggested above they will make great strawberry shortcakes! I will make them again…..I always give recipes a second try. Hi Judy! You could try baking them a little longer if you’d like them to be crispier 🙂 I’m glad you enjoyed the recipe, though! Happy baking! Hi there! Was wondering on freezing instructions! Thanks! I found that if you grate the cold butter it comes out and does not spread all over the place. When I made the scones both my husband and I ate them without the glaze. So yummy. I also used a cookie scoop and came out with little scones. Quick question: would these work well with blueberries or raspberries instead? Was going to go straeberry picking tomorrow but their season just ended so going to pick something else instead. Already bought all the other ingresients so hoping to still make the scones. Hi! Can these be made with frozen strawberries? Also, I plan to make them ahead of time for work (flight attendant), what is the best way to prepare/freeze them to use a few days after making the dough? I can speak to the frozen strawberries; I tried it yesterday. Definitely better than nothing at all, but fresh strawberries or frozen blueberries would be far better. The frozen strawberries became mush. I was very worried the dough was ruined (a pretty runny mess, smh — up to the point I added the frozen berries, the dough had been perfect). Nonetheless, still delicious in the end, but nowhere near as pretty, and with some much too-soggy bites. I used fresh strawberries and my dough still turned into a mushy mess. Next time I will definitely be adding less than 1 cup. Hi!!! I made these yummy scones tonight and want to take them to work tomorrow any suggestions how can I store them overnight with glaze already on them? Would like to make a mini version of these for a tea party…. would the baking time be different??? These were my first attempt at sconesand the best I’ve ever had. The pictures were a huge help. I froze them for just a tiny bit & used cake flour to roll it out. I am not sure it made a difference but I have so much lol. I didn’t even get to glaze it. My 2 year old & I made & ate them together. We saved 2 for her father but they were DELICIOUS! I wanted to ask, could I substitute the strawberries for maybe blueberries or chocolate chips? Or even cheese? All the other recipes I looked up were so different from yours and I’m hesitant to try. Can’t wait to try these! Quick question though. Could I prepare/cut the batter the night before and bake in the morning? I’d love for these to be fresh and warm for work? You could make the dough and keep it in the freezer overnight 🙂 Just add a minute or two when baking. I made these for the first time on the day of the royal wedding and they were fabulous! My hubby and I love scones, but always find them dry and tasteless. Not this recipe! These are amazing! So flaky and not at all dry! My only problem was cutting the strawberries in quarters proved to be to big. Next time I will cut them into smaller pieces. Question: can I substitute chocolate chips for the strawberries? I cannot wait to make these tomorrow again! Great recipe! Just made these & I tried honestly to follow your recipe to a T…but I had to cut the strawberries more than in quarters they were so big…and I added a tad more sugar…everyone said they were delicious, my picture looks almost exactly like yours. I think I will cook a little longer next time because the strawberries left some wet areas in the scone…and I also like a ‘firmer’ scone…will look at your cupcake recipes next, thx! I’ ve made these twice in one month…oops! But they are delicious and who can resist anything “strawberry” in July. Cold butter is key to making good sconces (unsalted too). I made these today. They are moist but taste more like a biscuit. to me. It needs something, maybe more sugar in the actual scone mixture not sure. The best part was finding the strawberries when you eat them! If you have someone who does not like a sweet scone, this is the recipe for you. Absolutely awesome , perfect directions! Thank you! I made these and they were perfect and delicious and cute! They only kept for about 30 hours without losing their texture, so next time I’ll be sure to serve them within 24 hours. Also, they grow in size when baking so definitely leave room in between them!